As of mid-2008, TsSKB was preparing to defend the preliminary design of the vehicle in September 2008. According to Ravil Akhmetov, a top official at TsSKB Progress, Soyuz-1 could fly three-four years after the beginning of funding. TsSKB officials hoped that the new rocket's entrance into the market would be supported by an increased demand for the delivery of light-weight payloads into the low-Earth orbit, however initial investments for the development of Soyuz-1 were hard to come by. The funding breakthrough for the Soyuz-1 and follow-on rockets equipped with NK-33 finally came after a successful demo firing of the veteran engine on June 2, 2008. The miraculous revival of a decades-old NK-33 propulsion system was attended by a number of high-ranking government and military officials, including then commander of the Russian space forces General Popovkin. Russian military apparently had potential payloads for Soyuz-1 and wanted to have a backup for Rockot boosters, which were plagued by delays in the production of their upper stage engines. The successful test of NK-33 paved the way to a government decree on the Soyuz-1 signed by Russian Prime-Minister Vladimir Putin, thus bringing the project to the new level of federal support. In 2013, the head of TsSKB Progress Aleksandr Kirilin said that the entire project was estimated at 2.5 billion rubles. According to an agreement between the company and the Ministry of Defense, TsSKB Progress would invest 1 billion rubles from its internal funds and 1.5 billion would come from the military budget. TsSKB would finance the development of the Volga upper stage on its own. As of 2009, the accelerated development schedule initially called for the first launch of the Soyuz-1 rocket as early as 2010, but at the time of an August 2009 meeting between representatives of TsSKB Progress and NPO Avtomatiki (flight control system developer), the mission slipped to the first quarter of 2011. Still, TsSKB Progress officials apparently felt that it was critical to have a maiden launch of the Soyuz-1 ahead of a long-anticipated debut of the light-weight Angara rocket, also scheduled for 2011. Soyuz-1 reportedly promised considerable cost advantages in comparison to the light-weight Angara which offered similar payload capabilities. In June 2010, the head of TsSKB Progress Aleksandr Kirilin told official Russian media that the first launch of the Soyuz-1 rocket (then re-named Soyuz-2-1v) would take place at the end of 2011. According to Kirilin, all contracts for sub-systems supply, including the NK-33 engine, flight control and telemetry systems, had been in place. The additions to the preliminary design of the launch vehicle were scheduled to go for a formal review and approval on June 17-18, 2010, Kirilin said. Review teams also evaluated the necessary upgrades at launch pads No. 3 and No. 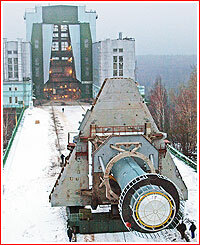 4 in Plesetsk to accommodate Soyuz-2 and Soyuz-1 launchers, Kirilin added. In the middle of 2010, TsSKB Progress representatives said that the manufacturing of the test version of the Soyuz-1's core stage was underway. At the time, its "cold" and live firings were planned as early as the end of that year. In February 2011, Lt. General Oleg Ostapenko, a commander of the Russian space forces, told Russian media that the first launch of Soyuz-2-1v (as Soyuz-1 became known) could not take place during 2011, due to a lack of payloads. At the time, Ostapenko planned a visit to Samara within a month for a discussion with TsSKB Progress of the further development schedule. However just a month later, a spokesman for the Russian space forces, Aleksei Zolotukhin, reconfirmed that Soyuz-1 would fly in 2011. Unofficial reports at the time said that during its first test launch, scheduled at the end of the year, the vehicle would carry the Aist satellite developed at TsSKB Progress. By mid-May 2011, the launch was promised at the beginning of 2012. During Paris Air and Space Show in Le Bourget in June 2011, the mission was promised in April 2012. At the time, the shipment of the first flight vehicle to Plesetsk was promised for Dec. 15, 2011. The rocket's payloads in the first mission were confirmed as Mikhailo Lomonosov and Aist satellites. The test flight program of the Soyuz-1 rocket, involving five launches, was to be completed in 2014. In August 2011, the head of TsSKB Progress, Aleksandr Kirilin, told Russian media that all design documentation for the Soyuz-1 rocket had been completed and the production and testing of its components had been underway. In March 2010, Roskosmos announced that the RD-0110R (14D24) engine developed by KBKhA design bureau in Voronezh would steer the Soyuz-1 (Soyuz-2-1v) rocket during the first stage of the flight. On December 13, 2011, an operational prototype of the first stage of the Soyuz-2-1v rocket, designated EU-763 (where EU stood for experimentalnaya ustanovka -- experimental article), arrived to NITs RKP test center in Peresvet, north of Moscow in preparation for critical testing of its propulsion system. As usual for the R-7 family of rockets, during the transportation, the oversized core booster was split into two components: 2A, comprised of a propulsion section and a kerosene tank and 1A - an oxygen tank. Following the assembly of the stage, NITs RKP planned to conduct two "cold" tests, KhSI, and one "hot" static firing of a flight ready booster, OSI, inside a special test stand during 2012. The live firing test would be the last major development milestone, clearing the vehicle for the first flight. On Jan. 6, 2012, after its checkout at the processing building, a fully assembled stage was rolled out to the test stand IS-102. 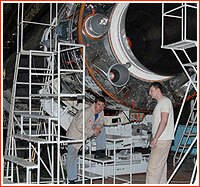 On March 21, 2012, the Soyuz-1/Volga development team held a meeting of Chief Designer Council in Samara. Around that time, the first full-scale test firing of the vehicle's first stage was promised at the beginning of summer. In preparation for this crucial milestone, the stage underwent the "cold" test, known as KhSI-1, on April 19, 2012, during which cryogenic liquid oxygen oxidizer and kerosene fuel was loaded onboard for the first time. Another similar test was expected before the actual firing of the onboard engine. The second KhSI test (KhSI-2) did take place at NITs RKP during June 20-22, 2012, and reportedly rehearsed all processing and fueling procedures with the rocket all the way up to a liftoff command. The trial involved loading of 33.8 tons of kerosene fuel and 85.2 tons of liquid oxygen oxidizer onboard the first stage of the Soyuz-1 vehicle. The second cold test cleared the way to the test firing of the rocket's propulsion system, which at the time was preliminary scheduled for August. The 200-second firing of the first stage of the Soyuz-2-1v rocket was set for Thursday, August 16, 2012, around 20:00 Moscow Summer Time at NITs RKP facility in Peresvet, north of Moscow. Although, official Russian media made no statements on the matter at the time, sources in the industry said that the test had failed after only few seconds of firing and resulted in the damage to the propulsion section of the rocket, but no injuries. According to unofficial sources, an erroneous shutdown command had been issued based on data from the RD-0110R steering engine which indicated that the engine's turbopump exceed an allowable rotation speed. The turbine of RD-0110R was destroyed, even though all input parameters for its operation seemed to be normal. On August 17, the Interfax new agency quoting unnamed sources reported that both the engine and the test facility had been damaged in the botched test. As it transpired by August 19, the erroneous shutdown command turned off only the steering engine, leaving the main propulsion system firing for some five seconds using the propellant still remaining in the supply line. As soon as the oxidizer was expended, rotating turbopump was destroyed leading to most of the damage. The programming of the test stand was blamed for the failure. Ten days after the failed test, industry sources reported that a new test schedule signed in the wake of the accident had called for the second attempt to test the core stage of the Soyuz-2-1v rocket in February 2013. Observers considered such a timeline too optimistic and predicted that no key organization involved in the project would sign a permission to proceed with the maiden flight of the rocket before a successful static firing of its core stage. Following a botched firing in Peresvet in August, technicians struggled to remove the severely damaged EU-763 article from its test stand. The badly mangled tail section made normal handling operations impossible. 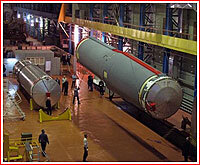 TsSKB Progress engineers had to remove tail section first and then to develop a process for transportation of the remaining propellant tank, which was also damaged. In the middle of September 2012, the EU-763 article was finally returned to Samara from NITs RKP. In October, TsSKB Progress Aleksandr Kirilin said that the test article had had to be restored and shipped back to NITs RKP no later than December 2012 to allow another attempt at live test firing at the beginning of 2013. In November, TsSKB Progress reported that the company had completed repairs of salvageable components of the rocket. Thermal insulation on the oxidizer tank was restored and elements of the pneumatic and hydraulic system, PGS, that had survived the explosion intact were re-tested. The company was also finishing the manufacturing of replacement parts for the severely damaged tail section. It was also necessary to "cannibalize" a fuel tank from the second copy of the operational Soyuz-1 rocket and adapt for the EU-763 in order to meet a three-month deadline set for a new test. Some internal pipelines and related hardware had to be replaced. TsSKB Progress also manufactured new stringers to attach the rocket stage to the test stand, redesigned a pipeline for dumping propellant in emergency and upgraded a fire suppression system. Subcontractors also supplied most critical components of the stage, including a new RD-0110RS steering engine and NK-33AS main engine. At the time, the new attempt for the critical live firing of the EU-763 test article was scheduled for the end of February 2013. In 2017, RKTs Progress announced that the formal flight testing of the Soyuz-2-1v rocket would be completed in 2018 after five launches. At the time, Soyuz-2-1v just completed its third mission. According to the head of RKTs Progress Aleksandr Kirillin quoted by the official RIA Novosti news agency, Soyuz-2-1v would continue to be propelled by the NK-33 engine until 2025. 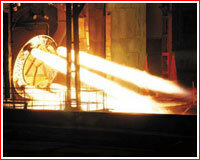 2008 June 8: A successful demo firing of the veteran NK-33 engine on June 2, 2008, is followed by the approval of funding for the development of the Soyuz-1 rocket. 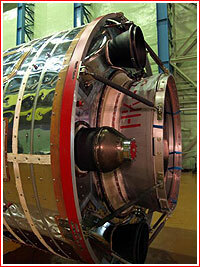 2010 March: Roskosmos announces that the RD-0110R (14D24) engine developed by KBKhA design bureau in Voronezh would steer the Soyuz-1 (Soyuz-2-1v) rocket during the first stage of the flight. 2010 middle of the year: TsSKB Progress representatives say that the manufacturing of the test version of the Soyuz-1's first stage is underway. 2011 August: Head of TsSKB Progress, Aleksandr Kirilin, tells Russian media that all design documentation for the Soyuz-1 rocket is completed and the production and testing of its components is underway. 2011 Dec. 13: The first stage of the Soyuz-2-1v rocket arrives at NITs RKP test center in Peresvet, north of Moscow in preparation for critical testing of its propulsion system. 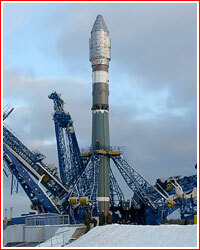 2012 Jan. 6: A fully assembled first stage of the Soyuz-2-1v rocket rolls out to the IS-102 test stand at NITs RKP. 2012 March 21: the Soyuz-1/Volga development team holds a meeting of Chief Designer Council in Samara. 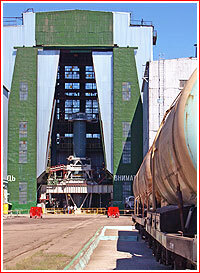 2012 April 19: The core stage undergoes the "cold" test, known as KhSI-1, at NITs RKP test center in Peresvet. 2012 June 15: In Voronezh, the KBKhA design bureau conducts a 280-second firing of the RD-0110R engine testing its steering system developed at TsSKB Progress. The steering engine previously went through testing at TsSKB Progress to prove its resistance to vibration from the accompanying NK-33A propulsion system. 2012 June 20-22: NITs RKP center conducts second "cold" test of the Soyuz-2-1v's first stage represented by the EU-763 test article. 2012 Aug. 3: The first Soyuz-2-1v rocket is rolled out from Facility 2212 of TsSKB Progress in Samara for a shipment to Plesetsk. 2012 Aug. 9: KBKhA design bureau conducts a final tune-up test, ZDI, of the 14D24 steering engine, lasting 280 seconds. 2012 Aug. 9: The first Soyuz-2-1v rocket arrives to Plesetsk. 2012 Sept. 4: The first Soyuz-2-1v rocket is rolled out to the launch pad in Plesetsk for four days of tests. 2012 mid-September: The EU-763 experimental article representing the first stage of the Soyuz-2-1v rocket returns to TsSKB Progress factory in Samara for repairs after a botched test at NITs RKP in Peresvet. 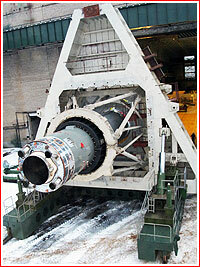 2012 Nov. 22: A live firing in Voronezh completes experimental testing of the RD-0110R (14D24) engine. 2013 May 30-31: A live firing of the Soyuz-2-1v rocket stage in Peresvet is interrupted by an emergency command 50 seconds before the completion of the engine firing. Plesetsk, 196-240 km, 62.8 deg. Plesetsk, 196-240 km, 67.1 deg. Plesetsk, 196-240 km, 81.4 deg. Plesetsk, 196-240 km, 98.3 deg. Plesetsk, Sun-synchronous 835 km, 98.7 deg. Plesetsk, circular 200 km, 62.8 deg. Plesetsk, 200-500 km, 97.4 deg. Plesetsk, circular 1,000 km, 62.8 deg. Plesetsk, circular 1,500 km, 62.8 deg. Plesetsk, circular 1,500 km, 82.4 deg. *Would not be needed with the use of RD-0110R steering engine. 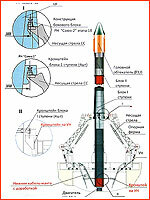 Two areas of modifications required in interfaces of the Soyuz launch pad with the Soyuz-1 rocket. Click to enlarge. A photo released by KBKhA design bureau in Voronezh in April 2012 apparently shows test firing of the RD-0110R (14D24) steering engine for the Soyuz-1 rocket.